I tried a Strida 3.2 folding bike on the show floor at Interbike 2007 last September and looked at the early pre-production 5.0 models. I liked it enough that I put a Strida on my Christmas wish list. Santa Claus arrived a little early to my household in the form of the FedEx man dropping off a big brown box labeled “Strida” and “DESIGNED IN THE UK” in big bold letters. My Strida 5.0 folding bicycle had arrived! The distinctive features of the Strida 5.0 include its triangular frame, light weight (19.4 pounds), a clean belt drive, incredibly fast folding, and compact size both folded and unfolded. Areaware in New York is the U.S. importer and distributor of this UK designed folding bicycle. While they’re working on developing their US dealer network, most purchases right now will be through online purchases over the Internet. That means you’ll receive your bike in a box just like I did and some assembly is required. The bike comes with almost everything attached and adjusted. Handlebars, brakes, pedals, tires and wheels and belt are already put together. It’s up to the end user to install the saddle and rear rack. On a conventional bike, saddle adjustment is trivial: you just loosen the seatpost binder and slide the saddle up and down. The saddle attachment on the Strida folding bike is somewhat less trivial and involves four bolts and quite a bit of wiggling, so you want to get it right the first time. It might be helpful to set another bike next to the Strida so you can compare saddle heights. After installing the saddle, you install the plastic rear rack. With a 5 kg / 11 lb weight limit the rack’s utility is limited, but it’s a handy place to hang a rear light and stash a lock and rain jacket. The engineering and quality on the 5.0 is a big step up from the 3.2. Besides the minor issue of saddle installation and adjustment (a one time ordeal), I was frankly very impressed with how smoothly everything just goes together on this bike. The brushed TIG welded aluminum frame looks very sharp and sleek. All of the mechanical engineers at my office are oohing and aahing over this bike right now (one of the guys literally sniffed the frame!) and absolutely love the design. These same designers won the Industrial Design Excellence Award in 2006. Another design engineer, James, gives his impressions of the Strida design on his Bicycle Design blog. Other features of the 5.0 include Kenda Kwest 16″ tires with reflective sidewalls on 24 spoke aluminum wheels, disc brakes, folding handlebars and folding pedals. Strida is manufactured in Taiwan by a contract bike manufacturer. Strida folding bikes are reportedly the best selling folding bike in Taiwan. I’ll put the Strida 5.0 folding bicycle through its paces over the next month and let you know how it goes in this Strida category. You can also view my photos of this bike on Flickr. So far, I’m impressed with the looks, the engineering and apparent practicality of this folder. More information about the Strida 5.0 and other models is available at Strida’s website. Sweet bike! I’m interested in knowing whether it’s a solid enough performer for a daily commute. I’ll be following your reports! Very intriguing…one of my engineering friends saw these on a website and immediately geeked out. It has that effect on folks, I guess. Looking forward to more reviews and your thoughts on this device! Ahh, I mistyped — “DESIGNED IN THE UK.” I’ll correct that in the article. Thanks for catching that Ghost. According to UPS, my bright yellow Strida 5 is due to arrive tomorrow. If I can’t find a YouTube video showing seat installation, I’ll post one. Interesting review. As a Chicago dealer, perhaps we could do something about that assembly video. I’m looking forward to your review of the ride. Good review Fritz and great Panda shot of the drivetrain. If I recall correctly, the box did say “Made in Taiwan” in bold letters underneath where it said “Designed in the UK”. It is good that they give both bits of info equal treatment on the box. I was on one just this week. The Seoul Bike Show last weekend had dealers selling them and my friend picked one up. He and I met for lunch on Thursday and I got to ride it home while he zipped by me on my Long Haul Trucker. Overall, it’s a good bike if you don’t like going fast (which I do). As a single speed (which you may be able to upgrade to a shimano internal hub if you’re dedicated and have a spoke threader) you top out at around 12-15 km/hour unless you’re doing some serious cadence. I wasn’t very impressed that the connection between the saddle and the saddle platform (it’s not really a seatpost) is plastic and has a fair bit of give on it. I would love to see it upgraded to aluminum or something equally sturdy. Otherwise, it performs well as a short-distance alternative to walking and on multi-modal commutes. I certainly wouldn’t want to use it on my short (3.5km) trip to work. It’s just too slow. Zipping around town from the office, campus, or from the bus to a nearby destination is certainly easier on a Strida. Oh, I should have mentioned he got it for about the equivalent of $500 dollars here, too! While it may appear to be a carbon copy, you won’t find me riding a fake Strida. Remember, the Strida is a precision machine; redundancies found in standard bikes have been stripped away to save weight. For this reason, I’d be very concerned about the longevity of the Chinese version’s joints, wheel hubs, etc. Any failure could be catastrophic. The Strida is an fine example of original design, thoughtful engineering and superb workmanship. A “carbon copy” possesses none of these qualities. Save a buck and break a neck. I am in China and just got one (clone?) direct from the factor in Yongkang, Zhejiang (the only practical option available to me). Fun to ride but a bit under-geared for flat Baoding. The belt seems over tight but the fully forward position of the adjustment screw suggests there is no scope to give it slack. After a couple of hours riding the bearing seems rough and a little noisy (btw it is 33C here and I understand the belt shrinks when hot?). Any suggestions? Umm, John. I’d like to see some proof with your statement. I just picked up one here in Taiwan and it clearly stated “Made in Taiwan”. Unless, your information has it that Taiwan is China. But, that is for a completely separate discussion. Ian, sorry but I don’t have any ideas about the overly tight belt. Have you tried the Asian Strida forums? True, they are all manufactured in China. Ming Cycles bought the rights to produce them when the patent expired. 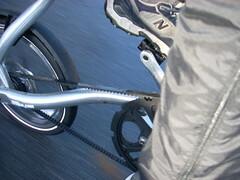 The kevlar belt on Strida shrinks in hot weather and gets longer (loose) in cold weather, so it needs readjustment between seasons. The less tension on the belt it is, the less the resistance is, so it is better always keep it as loose as possible. Bigger tyre on the rear wheel (like 16 x 1.75) will make Strider a little faster. No such problems so far over about 350 miles on my 5.0 though I read on bikeforums.net from a Strida owner whose cranks were installed on the wrong sides causing them to almost fall off and also stripping the threads. The Strida 5.0 is substantial enough in build quality for daily commutes over short distances. I addressed cosmetic damage to the frame being caused by repeated folding and installed two of those rubber-Velcro band frame protectors made by Ming. Also got a handy kickstand, lights and a seat bag. I’m all set. I had a similar problem with my Strida 5 clone – I used a hammer to strike the bolt on the bottom of the bottom bracket, with a small piece of wood in between to protect it and the frame. I thought that my belt was too slack, because of the rough noises that were coming out of it, but I realised it was too tight. I partially undid the bolt on the bottom of the bottom bracket, then hammered it gently until it was halfway across, and the belt was quite loose, but it runs fine- I went up the steepest hill I could ride up, and the belt didn’t slip, even though it’s easy to push the belt to make it touch the frame. Albert, the noise in mine finally went away when the peddle bearings failed. I replaced them with folding peddles that are used on electric/peddle scooters. These are heavier but the only available in Baoding. Four spokes in the rear wheel broke but in Baoding no one stocks the correct length replacements. Also the plastic luggage rack cracked in Beijing’s sub-zero weather. Anyway, coming back to Oz the baggage handlers must have thrown it out for the cargo hold onto the tarmac and destroyed the ball joint socket along with some other less critical damage. Re quality, different factories make things to very different QA standards even though the intended specs might be similar. I feel the clone is a little below par, and it wouldn’t be my preferred choice had it not been the only available option in the PRC. That’s true Ian even though the factories are across the street from each other there’s very difference QC standards in each factory. Even the fake and real apple ipods they are night and day both from a factory in china. I’d rather just order a real one cause a bad ipod and i’m just out of money. But a bad bike I might end up in a neck brace! You guys have to remember, the standards of Taiwan and China are completely different! Even though they are both china in the past. Taiwan is actually building their bikes with a higher standard and not entirely just for maximum profit with minimal parts. While China is just getting the shape and whatever cheap bearings and parts they can shove in there to fit. I’ve played with a clone vs a real one before I bought the real one. The clones brake calipers where kinda moving side to side like it was plastic as I locked up the brakes and tried to move it back and forth on the bike, while the real one didn’t even budge when the brakes where on. Also I’ve noticed some rubbing on the belt to the wheel. Might’ve seen a pretty bad clone so it kinda turned me to get a real one. Also Taiwan is an island on it’s own so you won’t really find a factory making clones of it next street over, their government is less corrupt and cracks down on Intellectual property theft in their country while China you can do as you please cause they just don’t care. I recently made a usability video review of Strida 5 that will answer a lot of the questions you may have about this bike. In addition there’s also an audio interview with the inventor of Strida – Mark Sanders. I have an almost new Strida 5.2 clone – purchased for.Â£120 on Ebay, including a carrying bag. It looks great and I loved it to bits (that was probably the problem) until after about 70 miles use, and about two miles on a canal towpath, two rear spokes snapped and others are very loose. Tomorrow I have to take it into a local repair shop to have the rear wheel rebuilt with good quality spokes. I hope that fixes it because I still love the bike. Overall the quality of the metal used seems to be poor – I have replaced a number of the stainless nuts and bolts with higher quality items. I’ll let you know if it turns out to be a good buy or a Turkey……………..
several times the specifed tension but if they are too loose the flexing will fracture and then break them way prematurely- they should last for years of normal use if they are tensioned properly and not damaged or nicked. The “clones” Gavin mentioned are cheaply made by a company in China, selling then in quantities through the Alibaba Trading Company. These pictures show the difference between real Stridas and the cheap knockoffs. A new, real & authentic Strida will soon be available in the USA for just $499. At this price, it’s senseless to buy a fake. Estimated arrival time is 1 March 2009. More details at RideTHISbike.com. I managed to obtain a set of genuine Strida spokes in about a week for around.Â£10 including postage care of the very helpful people at Deen’s garage in England. A local bike shop rebuilt the wheel and re-tightened the spokes on the other wheel (the front one) where several were found to be loose. So far I haven’t had the chance to ride the bike much but I will post here if there is anything much to report. 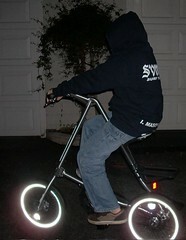 The bike shop expressed concern about the design of the (genuine Strida) spokes and wheel. Apparently a lot of tension is placed on the part in the spokes where they bend – that is where three of mine failed. It will be interesting to see if the genuine ones fail too! I wish the Strida 5 had kept the plastic wheels of the earlier models. I guess converting them would not be easy unless I went back to the old brakes also – not a good idea. If you guys still have problems with the spokes Strida this year is coming with an LT version where their wheels are 5 nylon spokes like a starfish pattern. no more trueing and rebuilding a wheel and they are much better than the old strida 3 wheels because they have a metal rim for high pressure tires! This to me is a huge plus if they ever start selling them separately to strida owners else it’s just sad that we can’t buy them. I can attest to the improvement these new rims make. I have ridden and am now selling the new Strida LT folding bike (the model with the resin/alloy rims). Not only are the new rims more durable than the previous rims (both the plastic ones on the Strida 3 and the alloy ones on the newer Strida’s), they also look nicer. And the Strida LT costs $200 less than the 5.0!!! wow not sure if anyone still reads this site but LT wheels are available separately now and they even come with the metal freewheel! no more cheap plastic freewheel!